Let's face it—foot products aren't glamorous. This is most notably evidenced by cult-fave product BabyFoot, which literally sheds the dead skin off your feet like a snake for weeks until ultimately revealing a new, silky-smooth pair. And for those of us too frightened to peel off dead skin, callus removers, pumice stones, and balms are generally the name of the game. So when we caught wind of another popular foot remedy that's not exactly—how should we say this?—the chicest means of caring for one's feet, we weren't surprised. But the contents of the product greatly intrigued us. If I was going to give these bad boys a shot, I really wanted to do it right and up the ante by applying a thick moisturizing product to work in tandem with the socks (as BelleSha recommends). I reached for some foot butter ($12), slathered it on thick, and then slipped my feet in. They felt super weird, like I was sticking my feet into squishy silicone sacks, but it was a good kind of weird. I was into it. I woke up the next morning, socks almost suctioned to my feet, and peeled them off. What was underneath was shocking—my feet felt incredible. They were so soft and moisturized, unlike any other time I'd put foot cream on and slept in a pair of traditional socks. There were still some calluses on my heels and the balls of my feet, but much less noticeable than the night before. I'm sure with several more uses they'll soften right up. 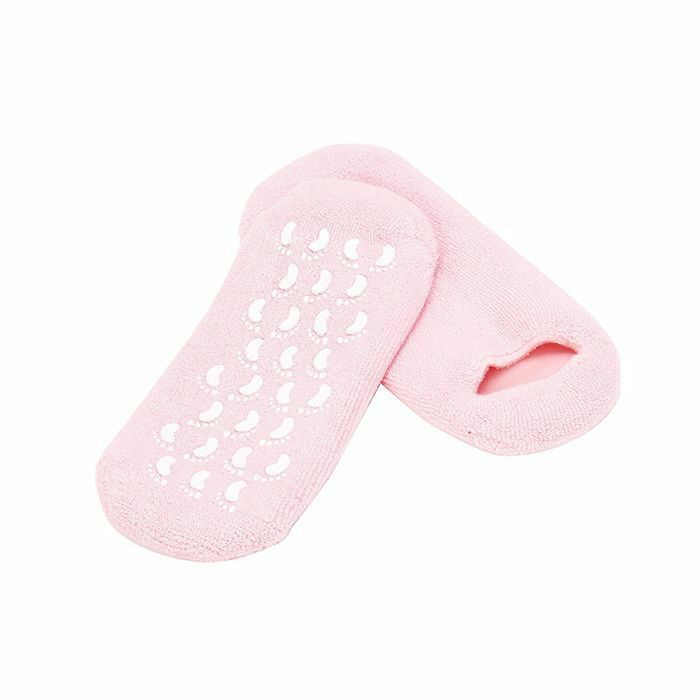 You can also wear the socks on their own without any foot product, as the gel's vitamin E and jojoba oils will seep into the skin while the socks themselves create a warm, moistening environment. (Don't worry, you can throw them in the washing machine between uses or give them a hand wash in the sink). If you're going to purchase these socks (which I totally think you should), beware of imposters—BelleSha warns customers of purchasing counterfeit products from third-party sources. If you want the good stuff, buy direct. So will you give these a try? Sound off below!